If a non-custodial parent with a child support obligation is working, Florida law requires his employer to withhold income from his wages for payment of his support obligation. In order for an employee's income to be withheld in such a manner, a Florida judge must issue an Order for Income Withholding and send a copy of it to the parent's employer. Often, a Florida judge enters an Order for Income Withholding at the same time he enters the Child Support Order. A parent who wishes to recoup past due child support payments may apply for help from the Child Support Enforcement Program by filling out the online application on the Florida Department of Revenue website. Once a parent has applied and provided CSEP with the other parent's employment information, CSEP will enter an Income Deduction Order to garnish the parent's wages for the payment of past due child support. Florida follows the Federal Consumer Credit Protection Act, which restricts the amount of an employee's earnings that may be garnished for child support. Under the CCPA, "earnings" are an employee's wages, salary, commission, bonus or periodic payments from a pension or retirement program, but usually not tips. 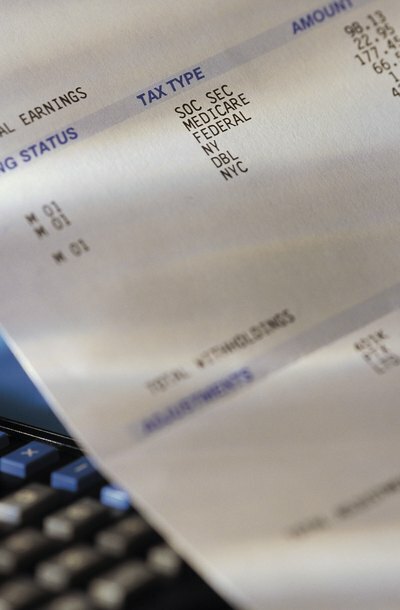 "Disposable earnings" are an employee's remaining earnings after legally required deductions, such as federal and state taxes and Social Security. Under the CCPA, if the employee is supporting a current spouse or a dependent child (other than the child or spouse covered by the support order), up to 50 percent of the employee's disposable earnings may be garnished for child support. If the employee is not supporting a current spouse or a dependent child, other than the child or spouse covered by the support order being enforced, up to 60 percent of the employee's disposable earnings may be garnished for child support. An additional five percent may be garnished for support payments that are more than 12 weeks past due. Florida law sets forth an exemption for wage garnishment under the CCPA. Under the Florida Statutes, a "head of family" is a person who is providing more than 50 percent of the support for a child or other dependent person. In Florida, if a head of family's weekly disposable earnings are $750 or less, such disposable earnings are exempt from wage garnishment, unless the head of family agrees to it in writing. Sixth Judicial Circuit of Florida: Instructions for "Income Withholding for Support Order and Florida Addendum"
In Michigan, the friend of the court may enforce a court's order for child support by withholding, or garnishing, a parent's wages. The friend of the court may also garnish both state and federal tax returns, to a certain limit. Under some circumstances, a parent who is owed child support can initiate garnishment, and at other times, the friend of the court is required by law to initiate garnishment.